1. Free Charge App Download On Google Play Store. 2. After the sign up process open free charge app and enter your mobile number and continue. 3. After enter your name, mobile number and password. And click on sign up. After you enter the otp sent by Free charge and put the otp and continue. 4. After you go to mobile option and enter you mobile number and select your operator and circle. 5. And go enter your recharge amount more then 75 rs after do you need. 6. And go click on "have a promo code" enter the promo code "NEW75" and apply the promo code. 8. enter your otp on your bank register mobile number. 9. 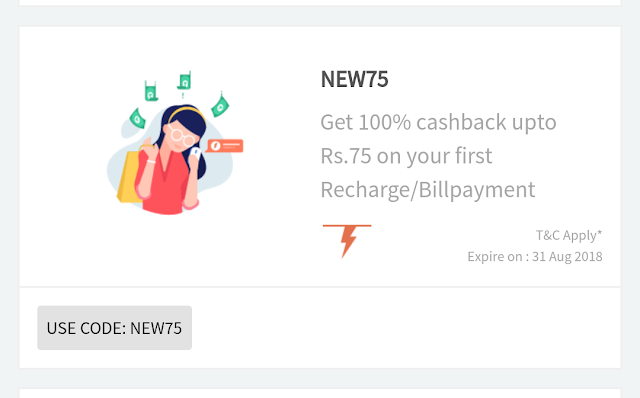 After the recharge successful immediately cash back credited 75 RS your Free Charge Account.